You know it is that time of year again where we are just busy, busy. Between working extra hours, preparing holiday meals and Christmas shopping, it all just becomes too much. Well at least dinner doesn’t have to be. Today I created a dinner for you that is filling, loaded with flavor and I have to tell you my Husbands new favorite. 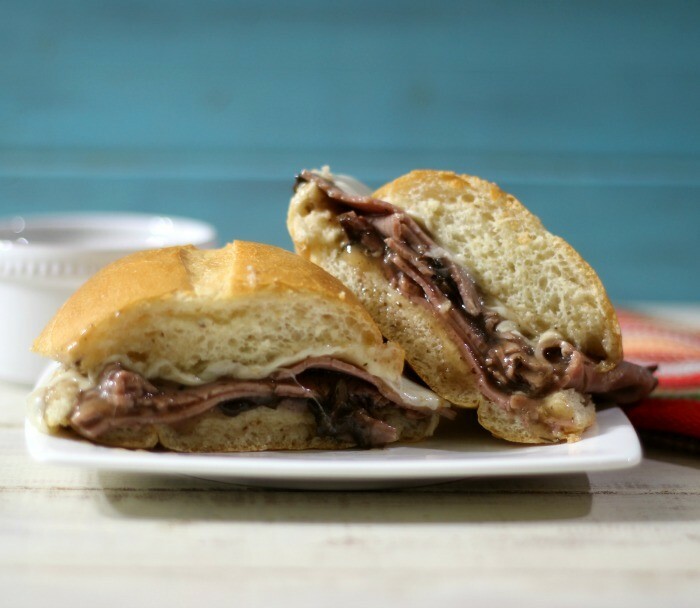 This is Roast Beef with Mushrooms Sandwich. This sandwich is so good! It’s rich, full of flavor, cheesy and has a wonderful dipping sauce. We had this for dinner the other night and it must have taken my about 6 minutes to make. You can’t beat that for a weeknight dinner and it’s so filling, you don’t need anything else. To make the sandwich I used Imagine® Organic Culinary Simmer Sauces in Portobello Red Wine. 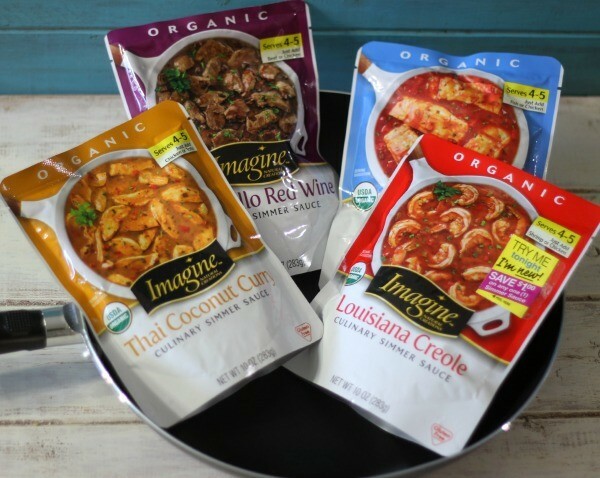 I love the Imagine® Organic Culinary Simmer Sauces because they are low-calorie (20 calories a serving), certified organic, the only simmering sauce that is organic. Plus it’s convenient, comes in a 10 oz pouch and serves 4 – 5 people. Plus the flavor, oh my gosh the flavor. It has a beautiful mushroom flavor with a deep hint of red wine. This sauce will make any meal taste rich and expensive. To make the sauce, I just opened my pouch, poured in a pan and let it heat up. I dipped my roast beef in it and placed it on my sandwich, than topped it with provolone cheese. I baked it in the broiler just until the cheese melted. So darn tasty! Then I took the leftover Portobello Red Wine sauce and used it for dipping my sandwich in. This really tasted like a sandwich that I would get at my favorite sandwich shop. I can guarantee we will be adding this to our dinner rotation. I did want to tell you, to save on some calories, I scooped out some of the bread in my sandwich. I saved about 75 calories, which is not to shabby. Scooping out the bread makes a nice pocket for your meat and more of the Portobello Red Wine Simmering Sauce. 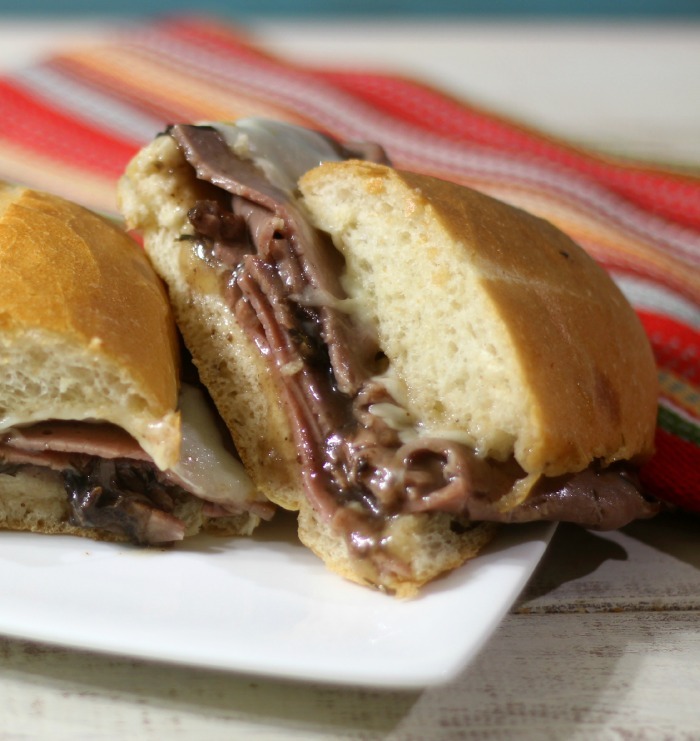 A rich, juicy sandwich made with thinly sliced roast beef, melted provolone cheese and dipped in a simple Mushroom Red Wine Sauce. 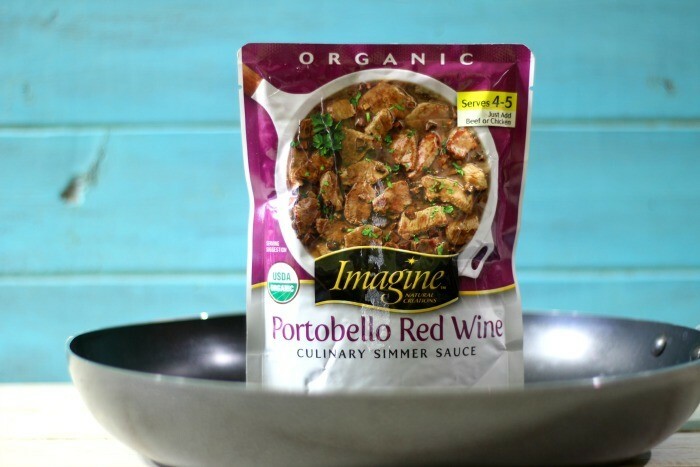 In a medium sauce pan, add Imagine Portobello Red Wine Culinary Simmer Sauce. Heat over low heat, and cook until just simmering (about 3 minutes); stirring occasionally. Cut rolls in half horizontally. Core out some of the bread (this is to save calories) and discard bread that you pulled out of the sandwich. 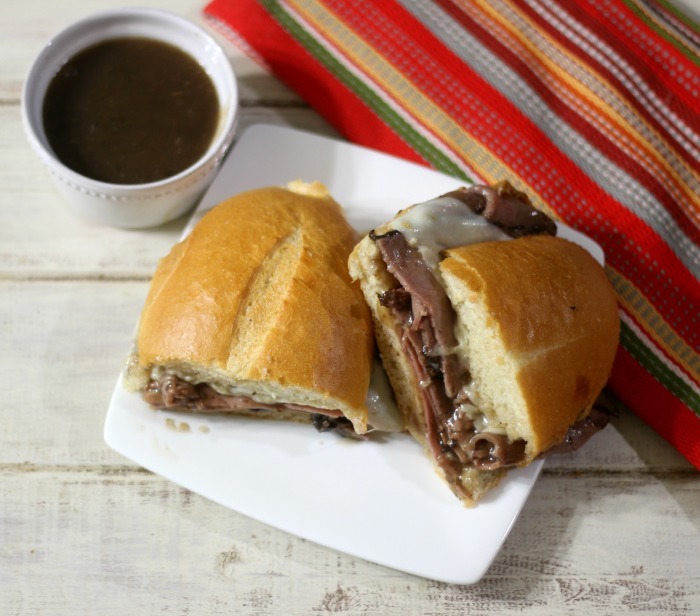 Dip roast beef in warmed Portobello Red Wine Culinary Simmer Sauce. Add 3 oz of roast beef to each roll. Top each roll with a slice of cheese. Place on baking sheet. Add sandwich to broiler, and cook until cheese is melted, about 2 minutes. 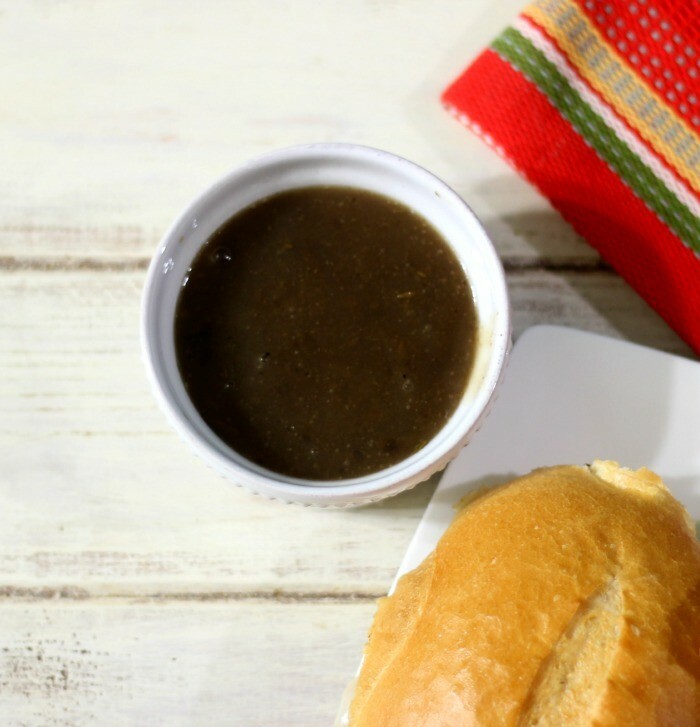 Add leftover Portobello Red Wine Simmer Sauce to a bowl, this is for dipping the sandwich in. 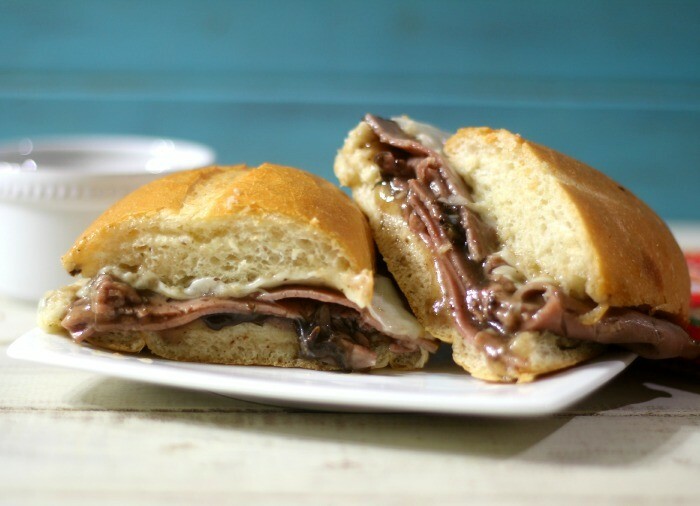 Cut sandwich in half and serve with a side of Portobello Red Wine Culinary Sauce. I bought my rolls from the deli, and unsure of calories. I did my best at calculating each roll by weighing them. Sweepstakes will take place on the Imagine® Facebook page (Mid-October through November), found here: http://on.fb.me/1r4uejQ. You can enter to win their own “Pan with a Plan” prize pack by entering the sweepstakes on Facebook. Entry rules are detailed online. Forty Eight (48) winners will be selected over the 6-week promotion. Each week, eight (8) winners will be selected to receive a “Pan with a Plan” prize pack (includes a saucepan, four Imagine® Organic Culinary Simmer Sauces, and a $25 grocery Visa gift card). What flavors would you like to try? I’m thinking of trying the Latin Veracruz next. It says it is made with peppers and zesty herbs and spices. Yum! I am having so much fun creating recipes with Imagine® Organic Culinary Simmer Sauces . The best part is; my family loves them. Quick weeknight meals with only about 3 or 4 ingredients. I feel like the lady with the plan with my pan!